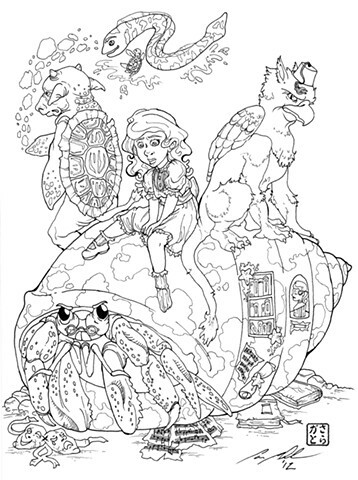 Going later into Chapter 9, Alice is sent to the Mock Turtle to hear his sad tale and is accompanied by the Gryphon, an old schoolmate of the Mock Turtle as they had gone to school together under the sea. The Mock Turtle speaks of how he was taught by an eel to writhe but was never very good at it due to his shell. The Gryphon speaks of a literature professor he studied under who "was a real crab." Instead of doing a traditional crab I opted for a hermit crab. On the side of his shell and all around are signs of what he taught such as dramatic literature (the theater masks), music (hey I consider that literature), history, and art. The Gryphon was the hardest because reference images for classic gryphons hardly exist anymore (seriously I kept finding gryphons that were parrot hybrids instead of eagles) and he is giving Alice a harsh look because he believes her to be a bit stupid. Alice is having a hard time taking in all that has been told to her through the Mock Turtle's tale and then this idea of a school under the sea. The Mock Turtle is turned away in sorrow, remembering his old teacher the eel and his youth when he was a real turtle.